Based on our analysis, we’ve shown that while coal makes up most of the grid’s electricity sources in Minnesota, plug-in electric vehicles (PEVs) result in about 50% fewer greenhouse gas emissions compared to gasoline vehicles over the life of the vehicle. If you are a PEV driver in Minnesota who wants to achieve even greater emission reductions, you can charge your PEV with energy from renewable sources. You can install solar panels and wind turbines on your residence to directly take advantage of renewables. You can subscribe to renewable energy programs through your utility provider to indirectly take advantage of renewables, which can be more affordable than direct installation as they don’t require high up-front costs. Renewable energy is not supplied directly to your house. Rather, it’s supplied to the grid, and the grid supplies a mix of energy sources to your house. By subscribing to renewable energy programs, you’re helping to make renewable energy a larger portion of the overall energy mix. You’ll still receive power, even when the wind isn’t blowing or the sun isn’t shining. Again, you’re helping to support more renewable energy in the grid, but you’ll also still receive a mix of coal, nuclear, and other sources of power. 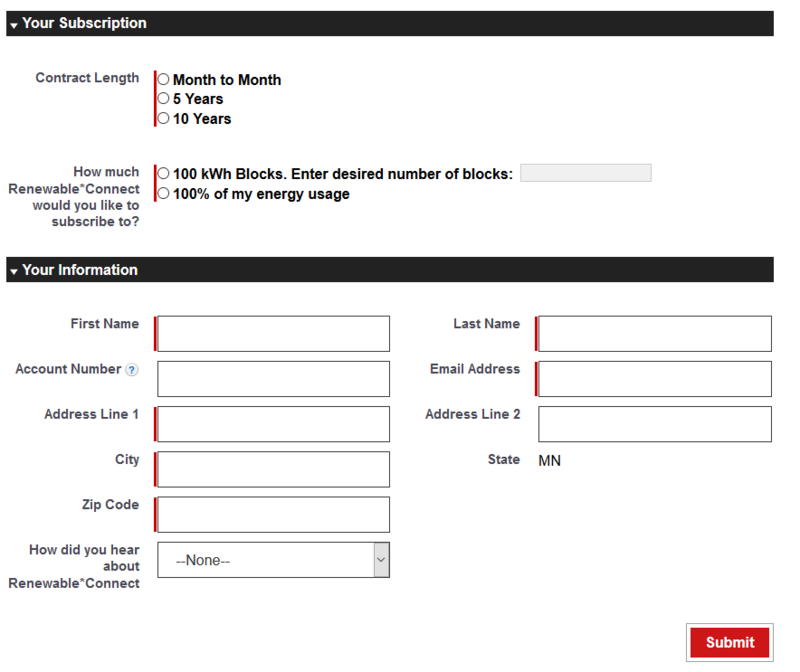 By subscribing, your energy bill will be higher than it would without subscribing. All programs have a small cost to participate, but you may see your bill decrease over time depending on the number of renewable energy credits you receive from your utility. While the cost is higher (at least initially), your subscription helps create additional demand for your utility to source more energy from renewables. They’re easy to sign up for! The majority of these programs allow you to sign up for them using a quick application on the internet (example seen below) and also offer some guidelines to help you estimate how many 100 kilowatt-hour blocks in which to subscribe. Windsource: Using Xcel’s Windsource program, you can supply up to 100% of your home with renewable energy after choosing how many 100-kilowatt hour blocks you want. However, it only sources energy from wind, so credits back to residents depend on how often the wind turbines are able to produce energy. Renewable*Connect: Renewable*Connect offers a way for residents to power homes with renewable energy through a blend of both solar and wind energy, allowing residents to reap the benefits from renewable energy, even on days that are cloudy or not windy. The program is offered in month-to-month, 5-year, and 10-year contracts. Of course, the longer the contract, the lower the price per 100-kilowatt hour block. It’s currently being offered on a pilot basis, so there’s a chance the available blocks could run out before too long. Solar*Rewards Community: Xcel Energy works with third parties to provide community solar benefits to its customers. It connects solar gardens to its electric grid and provides credits to customers that subscribe to solar gardens. However, Xcel Energy cannot advise customers on which gardens to subscribe to, and navigating the fine print on community garden subscriptions can be challenging for someone who is new to subscription programs. 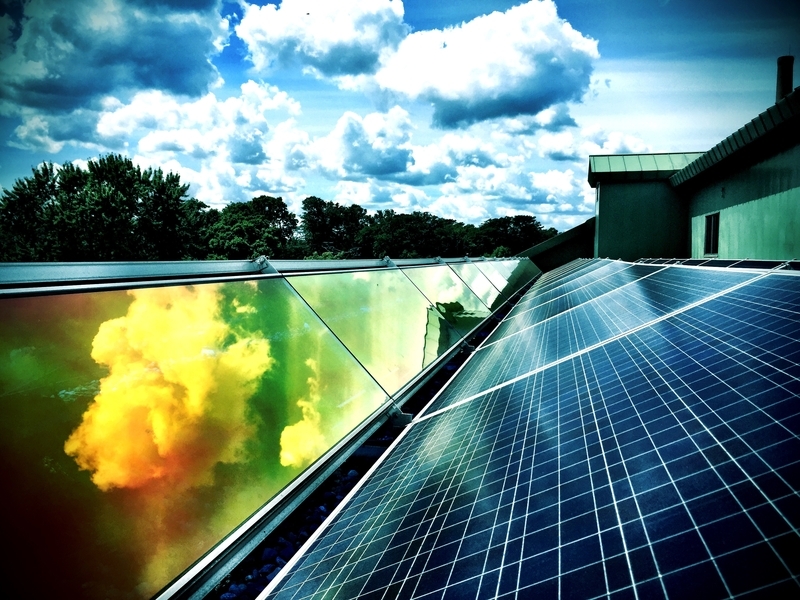 Thankfully, there are other organizations, like Clean Energy Resource Teams (CERTs) and Citizens Utility Board (CUB) Minnesota, that can help residents make informed decisions about subscribing to solar gardens. Revolt: Through December 31, 2017, customers of Great River Energy and its cooperatives have the opportunity to power their electric vehicles with 100% wind energy at no extra cost for the lifetime of the vehicle. It comes in the form of renewable energy credits (RECs) back to the customer, offsetting the energy used to charge the electric vehicle, which is about 5,000 kilowatt-hours per year during the lifetime (up to 10 years) or lease of the vehicle (up to 3 years). One thing to note, however, is that this program is targeted at providing renewable energy for electric vehicles – not for home energy use. Wellspring: Members that belong to one of GRE’s 28 member cooperatives can subscribe to wind energy through the Wellspring program. The program offers members the ability to choose how much wind energy they want to buy in 100-kilowatt hour blocks with the opportunity to purchase up to their normal monthly consumption. Wellspring Solar Program: Similar to the Wellspring wind energy program, members can subscribe to solar energy for a nominal monthly fee. Members can either purchase a set amount of 100-kilowatt hour blocks each month or allow it to fluctuate based on the amount of energy they use. Residents are encouraged to talk to their cooperative for more information about this program. Community Solar Garden: The new community solar garden will offer customers three ways of participating: fixed charge per kilowatt-hour produced (11 cents per kWh), fixed monthly subscription fee ($15.62 per month), and upfront payment ($2,132.15 per kW). All options require a 25-year agreement, but customers can leave the program at any time without a penalty. WindSense: WindSense offers Minnesota Power customers the option to subscribe to wind energy, anywhere from 100 kWh to 700 kWh per month. It’s an additional $2.50 per 100 kWh to cover the added cost of sourcing wind energy. TailWinds: While OTPC’s energy mix consists of 20% wind energy, the TailWinds program offers customers the option to subscribe to additional wind energy in 100-kilowatt hour blocks up to a customer’s average electricity use. Each 100-kilowatt hour block is charged $1.30 per month. The programs listed above are only a handful of what’s offered throughout Minnesota. If your utility isn’t listed above, check out mncharging.org or contact your utility to learn how you can power your drive with renewable energy.